Running a medical mission is a lot like working the trapeze or walking the tight rope with only part of a net. Falling does not always mean disaster but it does involve a few moment of terror as you figure out if the slip means a big bounce or a sudden splat. With an inventory list that is pages long, dozens of electrical devices that are shipped (really sent via ship and ground carriers which takes 2 months or more) or stored for a year in the humidity of the Philippines, with surgeons, anesthesiologists and other doctor who each have their own demands and preferences, getting the mission set up and ready to operate is truly a study in chaos and crisis management. This year was no exception, as we discovered missing oxygen regulators (that control the flow from the tanks to the anesthesia machines) to a bove (electro cautery device) which would not work with our cautery pens, the list of things that need to be fixed or found on set up day seems endless. It is not that these same crisis do not arise at home, it is that in Roxas City, the easy answers were all 10,000 miles away. Into this maelstrom stepped our guardian angel Dustin Vlcek, a bio med tech from Good Samaritan hospital north of Denver. Dustin was a last minute addition primarily tasked to help set up anesthesia machines in Kalibo (more on that below) but he became a critical player in addressing all the equipment issues that arose as things were unpacked and turned on. The prime example, was the failure of one bove machine to work with the cautery pens. This devices cauterizes tissue to stop bleeding and is important in facial operations as the profusion to the lips and mouth is extensive. This year we did an exceptional number of palates as we took the cases that many missions refuse as too complex so a bove for each table was key. The new bove pens have a switch built in so we have not been shipping foot pedals with the machines. Having a bove machine down was a huge problem. In stepped Dustin who determined that the problem could be resolved with a foot pedal. Of course, we had none of those so we were left scrambling to develop an effective work around. The answer was surprisingly simple, after a scavenger hunt at the local hardware store (not Home Depot or even a small Ace, but more like the hardware store in Mayberry), we located a door bell and 4 meters of speaker wire, shazam, we had a functional foot pedal. While the most memorable of the emergency work arounds it was simply one of many and we are all grateful to Dustin for his ingenuity and good humor and keeping it all working. 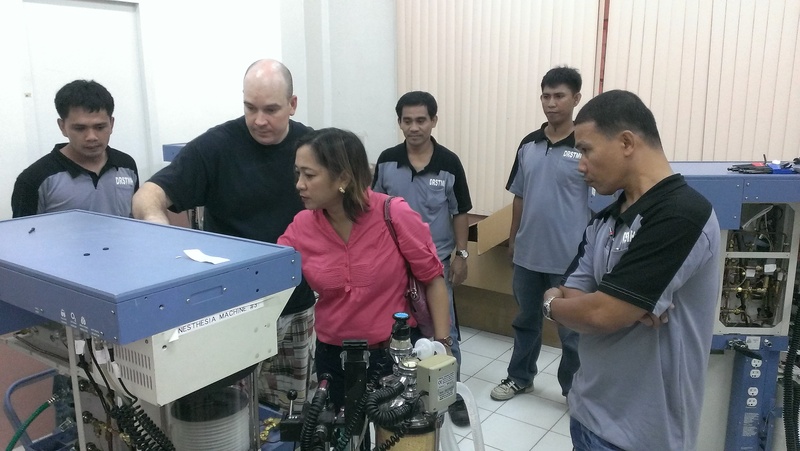 After days of extinguishing one fire after another, Dustin’s real mission arose on Wed as we traveled to Kalibo to reassemble 3 full sized anesthesia machines that had been donated almost 2 years ago by the Golden Ridge Surgery Center. 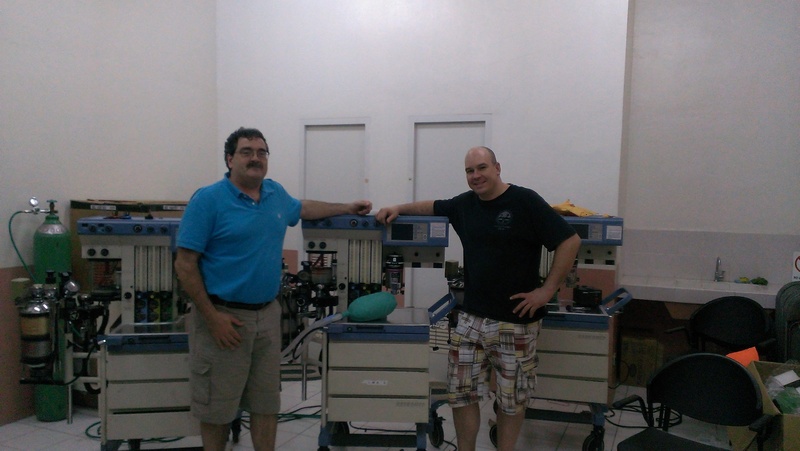 Working anesthesia machines are a precious commodity in the Philippines. The main hospital in Kalibo that is the only source of care for 100,000 indigent Aklanons and it only has 2 and one does not have a ventilator which means for certain procedures the anesthesiologist has to squeeze and air bag 12 times a minute for hours at a time. If we could get these devices up and running, not only would the Kalibo hospital have more capacity but outlying district hospitals would also get a machine as well. The cast of characters in the disassembly was large as Dustin and Sami Lababidi helped me rip the covers offer and disassemble the first unit. Randy Paulsen who helped develop the plates that we used to secure the main cart in a box so it could survive the 10,000 mile trip, Don Bailey who was instrumental in the disassembly of machines 2 & 3 along with Abe from Colorado Forex who shipped the boxes without incident to Kalibo. Miracle number one was that the boxes arrived in Kalibo intact and did not cost the Province one peso (which they truly do not have). The hospital maintenance staff is a hearty and hardworking group faced with a barrage of donated equipment, some of which never worked, limited training and zero spare parts so the fact that anything works is a testament to their skills. With their help the other two machines were assembled. Of course, we faced our own heart attack moment as the screen for machine number 2 failed to work – but after some problem isolation (for which Dustin deserves a PhD), he figured out that it was a cable issue rather than a screen problem and some further disassembly, we located the offending cable. As I look at the above paragraph, I realize that I have utterly failed to express to real fear as we looked at a blank screen that we spent 2 years, $1000 and hours of hard labor disassembling, packing, unpacking and reassembling an anesthesia machine that doesn’t work. This eventuality was why we brought Dustin. Good thing we did. After another hour, all the gear was up and working. The picture is of Dustin and one of the hospital anesthesiologists going over all the features. She was particular happy with the extra oxygen port for a nasal cannula. Apparently, they have to move hoses on their current machines. Anyways, after all the effort, fear and trepidation, wailing and gnashing of teeth, there are now three fully functioning anesthesia machines in the Province. 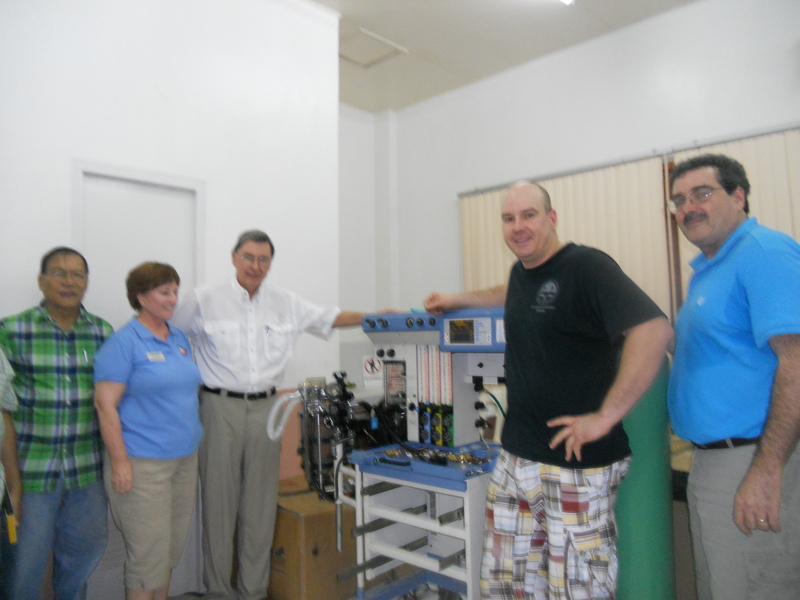 As a side note, there will soon be 4 functioning anesthesia machine in the province. After we finished the set up and training, the local maintenance techs asked if we could look an older model machine that was not working. Dustin again showed a flare for problem isolation, quickly determined that the machine itself was working but when he went to test the vaporizers and realized that they both were leaking. He quickly showed the techs how to disassemble the vaporizers and found that a number of the O rings had failed. All they needed to do was replace the O rings and they should be good to go. It was a very long day but leaving the province with 3 functioning machines and a 4th on the way, is a huge benefit to the patients of Aklan. Having started the whole project in May of 2011 with nothing but a hope that these huge devices might be of value, leaving town having made it happen was really a great feeling, one we would not have had without Dustin so all of us and many future patients in Kalibo and elsewhere owe him a debt of gratitude that will be hard to properly express. All the Mending Faces volunteers provide valuable and unique services. The mission would be less successful if we lost even one, but in 2013, Dustin proved an extraordinary addition to the mission and we are already recruiting him for 2014.